At Christ Lutheran, we strive to connect to our community in meaningful ways. Here are some of our community ministries, and we invite you to participate! The Metro East Senior Nutrition Program and Senior Center is a lunch and activity program for Seniors age 60 and over. Join us Monday through Friday for fun activities including dominoes, bingo, shopping, and cards just to name a few. Hours of operation are 9:00 a.m. – 1:00 p.m. and lunch is served every day at 11:30 a.m. Transportation is provided if needed. The activities change each day and lunch is catered by Masterson’s. Please call one day in advance by 12:00 noon if you would like to join in the fun. There is no charge for the meal, however, donations are greatly appreciated. If you have any questions or would like to come to the center, please contact the Center Supervisor, Teresa Baker at 502-797-5767. Jeffersontown Counseling Services is now open at the Brick House at Christ Lutheran Church. There are currently two counselors working with Deaconess Karen Westbrooks, PhD, LMFT who is serving as the Clinical Director. The Marriage and Family Therapists see individuals, couples and families. To set up an appointment call 502-742-5473 and leave your name and contact information. You will be called by Deaconess Karen who will assist you with determining your counseling needs. 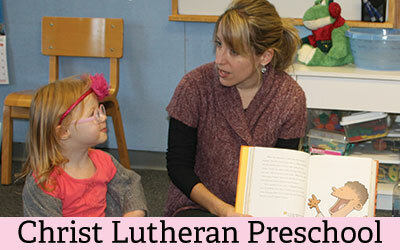 Counseling fee for members of Christ Lutheran Church is $55 per session, non-members $110 per session. Payment is due at time of service. Cash, credit, debit or check are accepted. A receipt will be given for self-filing of insurance claims. Check out the website for more information: www.jtowncounseling.com. Date: 3rd Thursday of each month • Time: 7:00 p.m. Date: 4th Sunday of each month • Time: 2:30 p.m.
For more information, contact NAMI Louisville at 502-588-2008. Christ Lutheran Church collects non-perishable food items for the JAM Food Bank on the 3rd Saturday and Sunday of each month. All donations are greatly appreciated. Personal hygiene items are some of the most needed items. From time to time we have people come to Christ asking for these items. We are accepting donations of the following: toothpaste, toothbrushes, shampoo, body wash, deodorant, body lotion, razors & shaving cream. All donations can be brought to the church office.